It was San Francisco Police Chief Heather Fong herself who called in the complaint about a Van Ness Avenue panhandler that ended with a fatal confrontation Sunday. The chief was driving through the upscale Russian Hill neighborhood at mid-afternoon when she saw 55-year-old Leonard Michael Cole panhandling on the median strip of Van Ness at Greenwich Street, Sgt. Steve Mannina said. 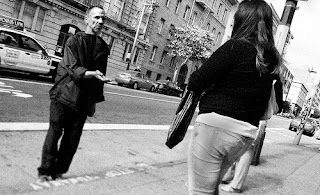 Panhandling on city streets has long been a pet peeve of Fong's boss, Mayor Gavin Newsom, who led a voter-backed initiative in 2003 to ban aggressive soliciting on median strips, parking lots and the like. "She spied the violation and called it in to field operations, and field operations called Northern Station," Mannina said. The message: Do something about it. And that is just what the cop who took the call tried to do when he arrived at the corner. According to police, the officer tried to cite Cole. The panhandler, long known to Northern cops for his drug and mental problems, responded by running up Greenwich. The officer, who has not been identified, called for backup and gave chase. At Polk Street, police said, the officer and two colleagues who had pulled up in a marked squad car approached Cole, who allegedly turned toward them with an 8-inch knife. According to police, the officers repeatedly ordered Cole to drop the knife. Instead Cole lunged, and one of the officers opened fire. Cole died three hours later at San Francisco General Hospital. The police, district attorney and Office of Citizen Complaints have all started investigations, which is standard procedure.